Check out our Turkey Day Sale happening all weekend. The beloved Thanksgiving tradition returns! 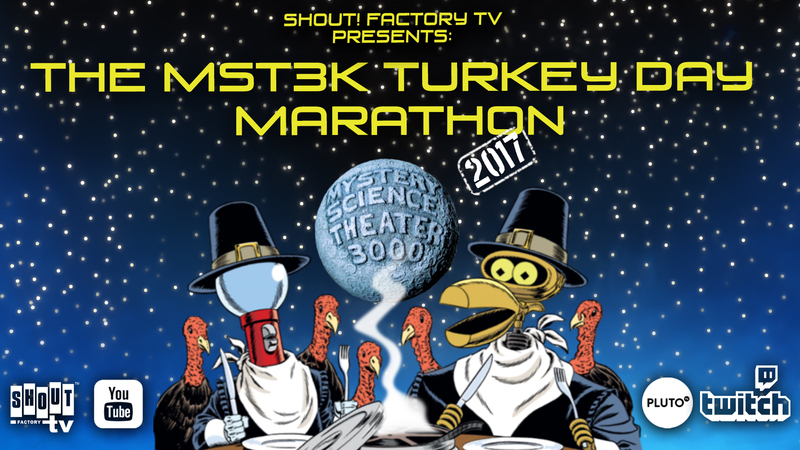 Join us on Thursday, 11/23 for the 2017 Mystery Science Theater 3000 Turkey Day Marathon. It all starts at 12pm Eastern / 9am Pacific and features six classic episodes with brand new intros from Joel Hodgson, Jonah Ray and Felicia Day as they celebrate the momentous past year in MST3K history. Our thanks to The AV Club for breaking the news! Tune in to watch on Shout! Factory TV, the Shout! Factory TV Twitch Channel, the Pluto TV MST3K channel or our official YouTube channel. Join the conversation using the hashtag #MST3K. It wouldn't be Thanksgiving without the (cinematic) turkey, so join us on Turkey Day and add a little cheese to your family dinner! I have Shout Factory through Amazon, but see no way to stream the marathon tomorrow? I can smell the Gamora from here. But no announcements planned? That doesn’t bode well. Do I get the credit for pushing you guys to finally announce this? No?